You may think twice about handing this credit card to your waiter. A bank in Kazakhstan is introducing an exclusive credit card made of gold, diamonds and mother of pearl. 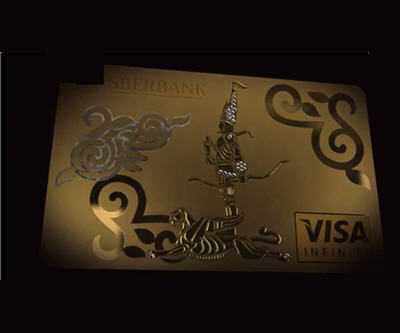 The Visa Infinite Exclusive card, now being marketed by Sberbank-Kazakhstan, will grant the user perks, such as lounge access at airports and discounts on hotels and meals. The bank even throws in an iPhone 5 and a Montblanc card case. The card will cost $100,000. The bank says it spends about $65,000 to make the card, but the remaining $35,000 stays with the user. The bank produced a video extolling the new card.